dancing over the rocks of a cold mountain stream, or walking Pete and Cole, her Cocker Spaniels, on a crisp fall morning, the Reverend Dr. Doris Chandler cherishes being outdoors. Nature feeds her soul and inspires her to protect the environment so future generations can enjoy the earth’s beauty and fragility. 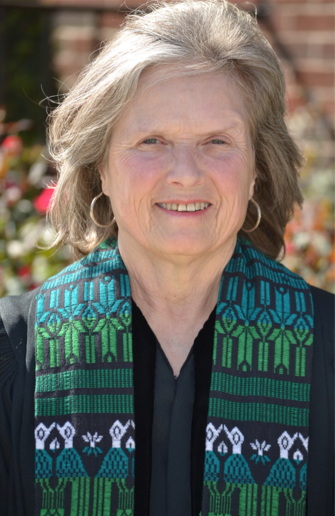 Reverend Dr. Chandler enjoys gardening, and she finds caring for plants to be a spiritual exercise. She loves long walks and a cup of hot chocolate crowned with a marshmallow on cold winter mornings. ​from Columbia Theological Seminary in Decatur, Georgia, and her Doctor of Ministry from Union Presbyterian Seminary in Richmond, Virginia. Since her ordination as a Minister of Word and Sacrament, she has served three churches. Reverend Dr. Chandler also taught Advanced Placement Chemistry, Honors Chemistry, Chemistry, and Advanced Placement Physics in Alabama public schools. This verse, Micah 6:8, is Reverend Dr. Chandler’s spiritual plumb line. For her, doing justice, loving kindness, and walking humbly with God means embracing residents in prison, walking a rescued kennel dog, feeding the hungry, and resisting anything that diminishes the dignity and worth of all persons or creatures. It also means writing letters to local ofﬁcials and state and U.S. legislators asking them to protect the environment, feed the hungry, and pass legislation that ensures the humane treatment of animals. These are just some of the ways Reverend Dr. Chandler lives out Micah 6:8. Reverend Dr. Chandler looks forward to hearing from you! You may reach her at pastor1presbyterian@gmail.com.